But there was one today and it is certainly something. I woke up to orange light pouring in through the windows, which changed to yellow by the time I got out of bed. Walking along the street to the bus stop had an eerie feel, it was quiet and the air was hazy. All the cars had a thin coating of dust, like a morning frost. The streets seemed empty but the bus was packed, and made it's way into the city through the dust clouds. 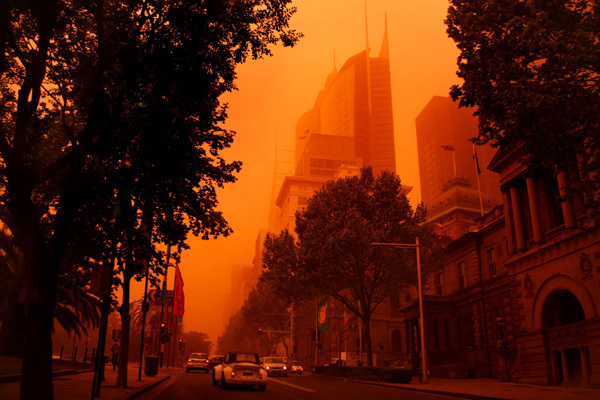 In the CBD the buildings vanished into the dusty distance as though into fog. There was a thick coating of dust on the concierge's station at the Hilton, a rare sight. The dust has a red tint, I wonder how far it has travelled?